Please visit www.penandpapersports.com to see our new and improved site!! VISIT NOW and be sure to subscribe!! Posted in Baseball, Basketball, Cricket, Cycling, Delhi 2010, Football (AFL), General, Golf, Horse Racing, Ice Hockey, Interviews, Motor Sport, Rewritten, Rugby, Soccer, SuperCoach, Surfing, Swimming, Tennis, The Rumor File, Tweet Tweet!, Uncategorized, Who's Hot... Who's Not! A coastal city filled with an abundance of culture, ranging from it’s modern cafes to upmarket pubs and all the way through to it’s funky art gallery’s, Vancouver has ranked as one of the greatest cities in the world for more than a decade. Furthermore, as of 2010, the third-largest Canadian city was ranked the 4th most livable city in the world. Metropolitan Vancouver is home of Canada’s elite business men and women, and according to Forbes, Vancouver has the 6th most overpriced real estate market in the world and was second-highest in North America, after Los Angeles. One would think that a city with such a glowing reputation and a predominantly civil society would be immune from violence, however when it comes to ice hockey, all reputations are quickly forgotten. 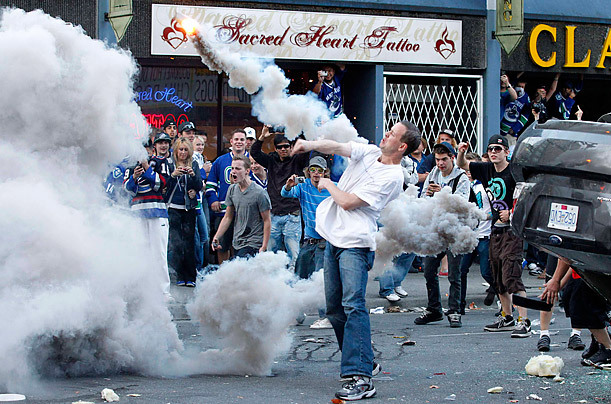 On the evening of June 14 1994, as many as 70,000 disappointed Vancouver Canucks fans took to the streets of downtown Vancouver after their side lost Game 7 of the Stanley Cup Finals against the New York Rangers. The loss, in the deciding game, ended their quest for a maiden Stanley Cup Championship, 24 years since they first appeared in the National Hockey League (NHL). In total, 540 Police Officers were required to subdue the fans as fighting, theft, looting and vandalism savaged the streets, whilst in excess of 200 people were injured. In just twelve hours, the damage bill soared to in excess of $1.1 million (Canadian). The aftermath was extreme with numerous fans arrested, including Ryan Berntt who was shot in the head with a rubber bullet. Berntt survived however spent four weeks in a coma and suffered severe brain damage. He went on to sue the City of Vancouver, however the Court found in 2001 that he was liable for his own injuries as a result of his behaviour. From that wild night in 1994, seventeen peaceful years passed by as the Canucks failed to secure another Conference Championship. This all changed in 2011 though when the Canucks once again reached the Stanley Cup Finals after finishing the season with the best record in the NHL and consequently being awarded their first ever President’s Trophy. From there, the Canucks defeated the Chicago Blackhawks in seven games (4-3), the Nashville Predators in six (4-2) and the San Jose Sharks in five (4-1), progressing through to just their third Stanley Cup Finals. After a 2-0 lead in the best-of-seven game series, the Canucks fans were starting to get restless and started to believe that 2011 would finally be ‘their season’, however two losses tied the series after four games. Game five went to Vancouver and they were just one win away from the title, however when the Boston Bruins won Game 6 comfortably, it once again came down to Game 7. Unfortunately for the Canucks players and fans alike, it was another heart-breaking loss as the side went down 4-0. 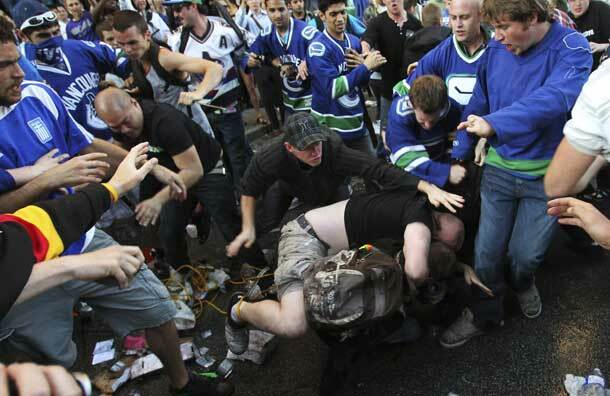 Despite the loss and another missed opportunity for a maiden championship, nobody could have predicted the repeated violence which gripped the streets of Vancouver between 8pm and midnight, as fighting, looting and vandalism returned to downtown Vancouver. 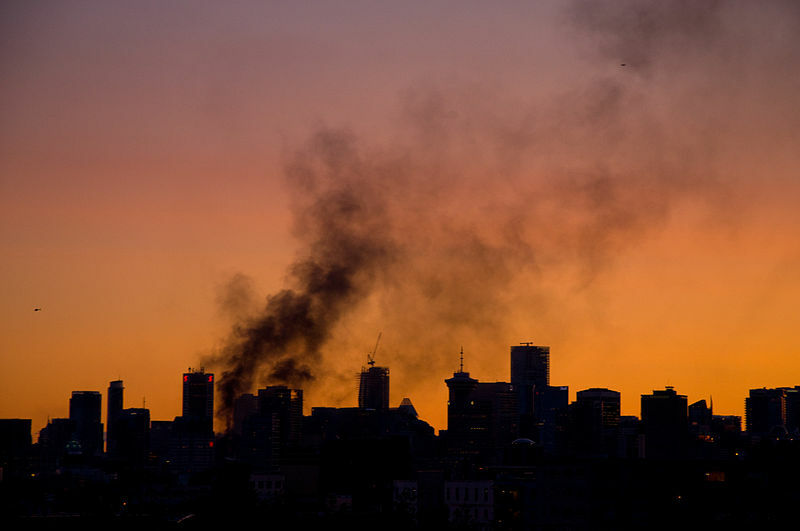 In just four hours, tens of thousands of fans caused just as much damage as the 1994 riots which lasted almost three times as long, with the estimated damage bill once again exceeding $1 million (Canadian). In statistics eerily similar to the previous riot, as many as 180 people were injured with one being listed as critical, whilst the police made just under 100 arrests. 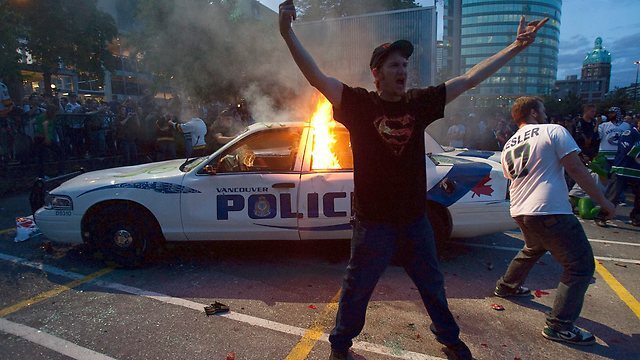 Now faced with the daunting statistic of an 100% chance of rioting after a Stanley Cup Finals Series loss, many residents of Vancouver are expressing their concerns quite vocally, with some calling for an increased police presence whilst others are calling for military intervention. Regardless of the action taken, the City of Vancouver will definitely be more prepared should the Canucks reach another Stanley Cup Finals Series. Of course, the alternative option would be a Vancouver victory, but who knows how the fans would then react?